Rockstar delivered another hit with Red Dead Redemption 2, but we all know what’s coming next from the acclaimed game developer. While we most certainly won’t see it for a few more years, Grand Theft Auto VI, abbreviated as GTA VI, is coming to the PS5. The settings of these games is always an important decision. Should the new title go somewhere new, or revive a fan favorite in glorious 4K? These are ten places we wouldn’t mind visiting for the next entry in the GTA series. Some of these places are backed by substantial rumors. Others are complete speculation, and a few are wishful thinking. Rockstar usually creates a map of their own based on real world locations. Given this, if they decide to use one of these locations, it will most likely be under a different name. For example, Liberty City is based on New York. So where will GTA 6 take place? Let’s check out the best places the world has to offer for a Grand Theft Auto experience! Our first pick is a GTA classic. The original GTA: Vice City was released on the PS2 and remains one of the best entries for a number of reasons. The setting, which was a fun twist on the 80s version of Miami, Florida, added a lot of color and style to proceedings. Not only has this setting been teased in the past, but a report from The Know revealed that a trusted source claims this is indeed going to be the setting of the next game. The game is currently dubbed “Project Americas” according to them. They even went on to predict that it would delve into the drug trade of the time and have the player visiting South America on occasion as well. Plenty of potential stories to work with here, which makes this one of the most likely settings for Grand Theft Auto VI. What’s wrong with dreaming big? Other games this generation have tried to pack the entire United States into a single map (I’m looking at you The Crew), and had somewhat successful results. With the power of the PS5 at their back, Rockstar could finally connect all of their cities together into a super map. Imagine being able to visit San Andreas, Liberty City, Vice City, and possibly other locations as well without ever switching games. It would certainly be amazing, but this kind of decision wouldn’t leave much for future titles to go on. They would have to plan for the long-term if they wanted to use a map as large as this. How would you like the next Grand Theft Auto to take place in the Windy City? It retains a lot of the scenic views that have inspired other locations, but it also has its own unique sights and a rich history to boot. If Rockstar decided to use this city, it would most likely be a way for them to turn back the clock and do their own take on Al Capone and the organized crime that ran rampant in Chicago throughout the 1920s. Even if they did a modern take, there’s plenty of great architecture and nearby water to keep players busy. Dubai in the United Arab Emirates is a shining example of luxury, nightlife, and the finer things in life. Sounds like the perfect playground for a GTA game, doesn’t it? Even the cop cars in this city are supercars like the Ferrari FF. Seriously, this setting practically writes itself. When I think about unique and culturally significant cities in the US, New Orleans ranks pretty high up on that list. I actually visited the city for the first time to attend Jazzfest, but I also got to soak in all the charm and history it has to offer. 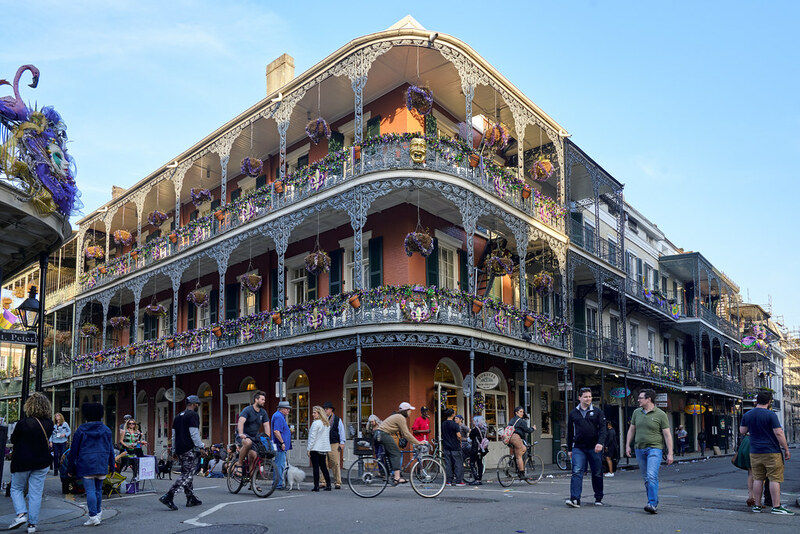 From street performers, to art sales, to the rowdy nightlife on Bourbon Street, this city is unlike anywhere else in the world. With a rich history and deep culture surrounding Mardi Gras and voodoo, Rockstar would have a lot of fun with a GTA VI in New Orleans. I know what you’re thinking: “Sleeping Dogs already did it.” I love Sleeping Dogs as much as the next person, it definitely got me thinking about what Rockstar would do with the same setting. Even if they decide not to use this for a GTA game, everyone should check out Sleeping Dogs on PS4, it’s as close as we’re going to get to a GTA in Hong Kong, and I mean that as a compliment. San Francisco was another place I finally got to cross off my list. The city’s amazing sights and extremely steep roads would make for a lot of hilarious driving. Watch Dogs 2 actually used this place as its setting with a lot of success. Of course, long-time GTA fans will remember that San Andreas already had a few places based on California locales. Los Santos is supposed to be Los Angeles, and San Fierro is similar to San Francisco already, so it could be in the cards! Speaking of cards, Las Vegas would be a fun place to gamble and get into trouble. Once again, San Andreas also featured a city called Las Venturas, which of course would be an alternate version of Las Vegas. Way back in 1999, we got ourselves a top-down game called Grand Theft Auto: London 1969. While the developers have said they don’t really have any interest in going back to that setting, plans change all the time. What kind of trouble could you get up to in London? GTA V had us playing as a Canadian for a time, which got me thinking about how Rockstar could do something in the far north. Not only would this city be great for a fresh new setting, but the winters could offer some excellent activities we haven’t really seen in Rockstar titles. Rockstar is going to release GTA VI, there’s no doubt about that. They’re also going to have to pick a place. Where would you like to spend the next several hundred hours of your life? Let us know in the comments! GTA VI should be set in the entire U.S. Rockstar always steps up their game each time, and that map would be bigger than anything else they’ve done. Should include cities like Liberty City, Vice City, San Andreas, etc.